NeoMenu - A new menu for your CMS! NeoMenu is a simple module displaying a drop-down menu. It easily adapts to your template because it uses the main Joomla CSS styles. Its design is manageable via the CSS integrated into the module or the template. You can use it horizontally or vertically according to your website. You are not limited in the displaying of your subcategories because NeoMenu manage them indefinitely, within the limit authorized by Joomla!. 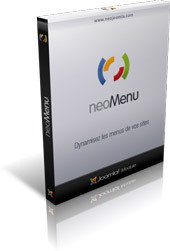 The NeoMenu module is free and compatible with 1.0.x versions of Joomla! 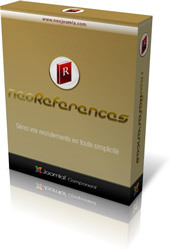 NeoReferences is component which enables you to manage your current and future references by category and thanks to a system of thumbnails clear and very visual! You can add an image for each reference which will be resized by the component, just click on it to see the complete view. NeoReferences was thought and carried out in order to be a useful tool to optimize your websites and/or links which you will publish in the component. It uses for that of the hard links having titles. This component is free, compatible with Joomfish! and delivered with two modules (incoming references and last references). For a few months, the popularity of Joomla has attracted a wave of hackers on the community. How are they caught there? Where are the faults? What to make to protect itself?